With luxurious rooms, fine dining, entertainment, shopping, and a fitness center, Hotel Valencia in San Jose is one of the top hotel choices in Silicon Valley. Drawing inspiration from French fashion art, Hotel Valencia invokes imagination and stimulates senses through its relaxing atmosphere brought about by the modern architecture filled with expressive murals. The hotel also has spectacular views of the Santa Cruz Mountains. Of course, the aesthetics of the hotel are matched only by the quality of the accommodations, dining experience and lush venues. There are 215 luxury guest rooms in Hotel Valencia, with each one a product of the signature designs of the renowned Rottet Studios of Houston. Each of the rooms sport a Spanish design, featuring oak-plank headboards, red laced patterned pillows, and clean white Valencia beds that make them the top choice for accommodations within San Jose, CA. Every room comes with everything guests will need for a comfortable stay. Beds come with 300-thread count linens for comfort and there’s a 42” flat screen TV for entertainment. There are also coffee makers, irons and ironing boards, as well as a complimentary newspaper. Each room also features climate control and wireless internet access. Some rooms are handicap accessible while others have balcony and courtyards available. The guest rooms have 350 sq. ft. of space each. 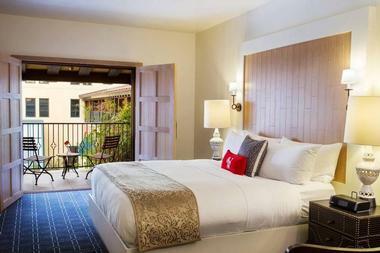 Traditional Rooms feature views of the Santana Row neighbourhood or the courtyard, depending on the location of the room. The rooms either have double beds or a king sized bed, a flat screen TV, a large armchair and desk, and a private bar. Meanwhile, the Deluxe Balcony Rooms feature fresh air balconies on top of the amenities mentioned above. Each room has a double bed version. There are also suite accommodations to choose from. Junior Suites feature the same great views offered by the guest rooms, but are more spacious with 650 sq. ft. Naturally. the furnishings are more comfortable, in addition to offering the same amenities as other accommodations. Executive Suites offer 500 sq. ft. in bedroom space and a separate seating area with a step out balcony. They’re also fully equipped with the same luxury amenities as the Junior Suites. Finally, the Presidential Suites are special rooms which are available upon request. With the Citrus Restaurant, Vbar, and Cielo, the dining experience is rich at Hotel Valencia. Diverse selections, fine cuisine, superb beverages, and a perfect setting to go with everything, guests will always have a place to dine that suits their tastes. The Citrus Restaurant presents California cuisine like no other, thanks to its global influence. The restaurant uses mainly the best locally available produce, meat, and seafood in compliance with the Monterey Seafood Watch program. Executive Chef Ocean Orssten presents a flavourful mix of dishes with unique ingredients from around the world. This open-air restaurant is filled with sheer curtains, warm walls, Venetian plants, and terracotta ceilings to make up an engaging European style courtyard – truly a unique way to dine in style. Intimate and modern, the Vbar is a great place for guests who are into ultra-modern lounges to chill. With flat TV panels, a top-notch sound system, and even vintage Spanish comic strips on the red acrylic bar it will entertain the senses on all levels. There’s also an expansive balcony which has a spectacular view of Santana Row. It’s one of the top “see and be seen” venues in San Jose, California. Cielo is a rooftop bar and a great place for those looking to experience a more relaxing bar scene. It’s on the Cielo Rooftop where the backdrop is no less breathtaking than the Santa Cruz Mountains. Here, guests can grab their beverage of choice while enjoying the sunset as seen only from a rooftop. The place has also been known to be a venue for all kinds of events. The bar also offers smoking and non-smoking areas. Finally, the Terrace is a more intimate alternative than the other dining destinations of Hotel Valencia. 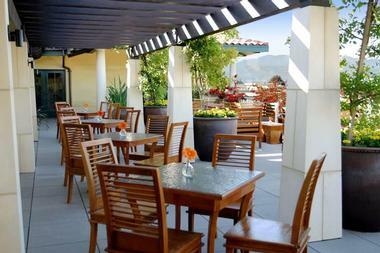 It’s a great place where people can escape Santana Row’s daily hustle and bustle. Here, they can enjoy their wine, whiskey, or other beverages of choice while having some delicious munchies on small plates which can be shared with a few friends. The rich, neo classic furnishings, blooming bougainvillea garden, and water fountain make the Terrace true to the al fresco dining experience it offers. Hotel Valencia offers wedding packages to compliment every dream wedding day, from intimate ceremonies to grand celebrations. The hotel offers a special discount for wedding events that need more than 10 guest rooms, which includes a Continental Breakfast, self-parking, and free internet access. There are over 4,000 sq. ft. of customizable wedding and event venues in Hotel Valencia. For example, couples can choose to have their ceremony on the terrace surrounded with Mediterranean beauty, citrus trees, blooming bougainvillea, and spectacular views. Of course, the hotel staff will take care of everything, from the catering right down to the entertainment. Whether it’s a corporate meeting, a small conference, or some kind of training seminar, Hotel Valencia is a great venue to hold these events. The hotel’s conference staff works with an on-site Five Star Audio Visual team to help make every event a success. Everything from catering to media will be provided in any of the hotel’s 4,000 sq. ft. flexible meeting venues. One venue worthy of note is the newly renovated ballroom that offers views of the Santa Cruz Mountains and the Mediterranean architecture. All meeting rooms also have access to natural lighting, making them great for day meetings and events. The European style courtyard, however, is more ideal for groups of 50 or more participants. The place is filled with Cypress trees and lit water fountains to match the warm California temperature. The Cielo Rooftop is also great for similar gatherings of up to 100 participants, but the featured backdrop is instead the Santa Cruz Mountain skyline. Here, guests can have a catered buffet type of catering or full. Finally, the Citrus Restaurant is the ideal place for events where dining will be the highlight. 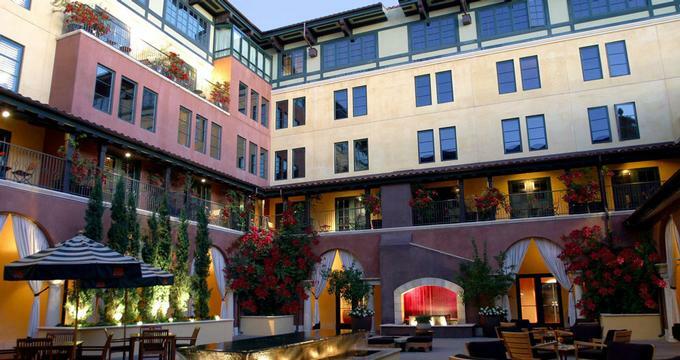 Santana Row is filled with so many places to see for anyone staying at the Hotel Valencia. There’s shopping, dining, and lots of entertainment every day, all within reach from the hotel. There are over 70 shops along Santana Row and 250 more at the nearby Westfield Shoppingtown Valley Fair. Those who wish to discover additional shopping can travel 15 minutes to the Old Town Los Gatos which offersworld class shops hidden away in an mall that provides a small town feel..
San Jose is home to the CineArts Theatre and Century Theaters. The Centre for the Performing Arts and San Jose Repertory Theatre is just ten minutes away from the hotel. Just across the street is the Winchester Mystery House. One of the best things to do in California is to visit San Jose’s wineries such as the Bargetto, David Bruse, La Rochelle, Pedrizzetti, and Savannah-Chanelle Wineries. All these wineries provide informative tours around beautiful scenery surrounding the places where fresh wines are made. Romantic Weekend Escape featuring stylish accommodations, custom-made Valencia beds, and a full American breakfast in bed. 15% discount to guests who stay 3 nights with accommodations and continental breakfast for two with complimentary wireless internet access. Wine Weekend Getaway for a stay with luxurious accommodations, local wine, and a prepared picnic lunch basket for some wine tasting. Back to: Weekend Getaways from San Francisco and Things to Do in San Jose.